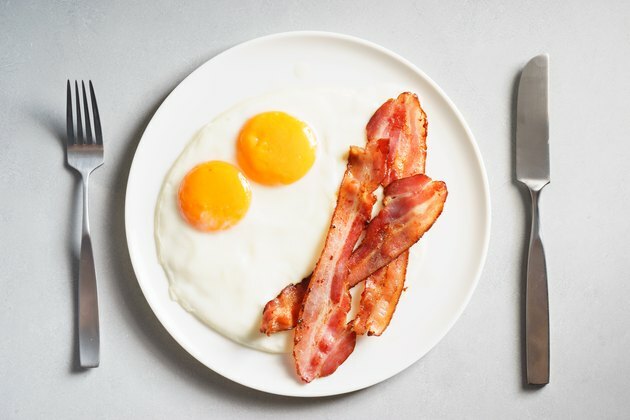 Are Bacon & Eggs a Healthy Breakfast? Bacon and eggs are a classic old-school breakfast — and for good reason. Starting your day off with protein helps regulate your blood sugar after your long night's fast and keeps you full for longer, while the protein helps feed and maintain your lean muscle tissue. The calories and saturated fat in bacon might give you pause, but indulging in bacon and eggs for breakfast a few times a week can definitely be part of a healthy, hearty diet. Find out more about the nutrition breakdown of bacon and eggs on a calorie counter. Bacon is generally made of pork that's sliced into strips, soaked in a solution containing salt, nitrates, and sometimes sugar or maple syrup, and then smoked. This process is what gives bacon its distinctive flavor and color. Some manufacturers use additives such as nitrites and artificial colors and flavors to speed the process, but many do not. Bacon has a high fat content, but some of the fats are actually the healthy kind, according to Chris Gunnars, BSc, writing for Healthline. Bacon contains oleic acid, which is the same kind of heart-healthy essential fatty acid found in avocados. It also contains saturated fat and high amounts of sodium, though, so keep your portion sizes to no more than two strips per meal and enjoy it no more than two to three times per week rather than eating bacon every day. Read more: Is Turkey Bacon Better for Your Health Than Regular Bacon? Eggs are inexpensive, versatile, loaded with nutrition and come in the cleverest natural packaging there is. Concerns about the cholesterol in eggs have proven to be somewhat overstated, according to the health experts at the Mayo Clinic. Dietary cholesterol has less impact on the cholesterol levels in your blood than the saturated fats, trans fats and salt in foods that usually accompany or are used to cook eggs. Eggs are high in protein, which helps build and maintain muscle tissue. According to researchers at Tufts University, a diet that includes a breakfast of bacon and eggs and lean sources of protein at lunch and dinner can help prevent the loss of muscle tissue, especially in older people. In addition to protein, according to University of California-Davis experts, eggs contain the B vitamins and vitamins A, D, E and K. They also contain phosphorous and trace amounts of other minerals — all for around 80 calories each. Most people can eat up to seven eggs per week with no ill effects, but cooking them with little to no added fat and pairing them with healthy foods can keep your protein levels up and your fat, salt and calorie counts down. The nutrition supplied by eggs and bacon is fairly sound when they're prepared simply, but where most people get in trouble is through either cooking methods or added ingredients. Buckets of butter, flurries of shredded cheese and clouds of sour cream add far more fat and salt than they do actual flavor. You don't need to spend much time cooking them, because, as the food enthusiasts at MyFitnessPal remind you, both bacon and eggs can be prepared in the microwave. You can also avoid adding fat to eggs by poaching, soft boiling or hard cooking them in water or scrambling them in a nonstick pan or a microwave egg cooker. Bacon should be cooked over low heat to avoid creating nitrosamines, which have been linked to certain cancers. Many manufacturers add vitamin C to their bacon to prevent this, but bacon that is crisped over low, slow heat poses less risk than if you fry it quickly and scorch it. Mayo Clinic: Eggs: Are They Good or Bad for My Cholesterol?